While concrete may sometimes seem invulnerable, it still requires regular cleaning and maintenance to ensure it lasts. This is especially important for decorative concrete installations, the primary purpose of which is to make your property more beautiful. Stains, cracks, and other damage can ruin its design, causing it to lose its value. Stamped Concrete: This type can be just as, if not even more, durable than regular concrete when a color hardener is used. To clean it, sweep and power wash the surface if it’s installed outdoors. For indoor applications, wet mopping is the only upkeep it will need. Use a mild detergent to get rid of dirt buildup. Avoid using deicing agents during the winter, especially within a year after its installation. If the surface starts to dull, apply a seal to restore its luster. This will also protect it from stains and fading caused by UV exposure. Overlay Concrete: Overlays can either be made of cement or with a blend of polymer resins, cement, sand, and other materials. They are applied on top of existing concrete installations to cover up surface imperfections or simply provide better aesthetics. Some overlay manufacturers recommend annual resealing for exterior applications. This will make them easier to clean while protecting them from stains and abrasions. Clean overlay concrete the same way you would stamped. 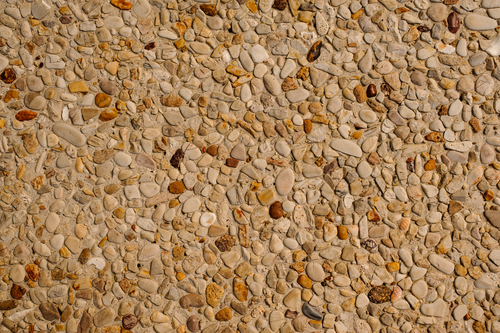 Exposed Aggregate Concrete: This type of decorative material is obtained by stripping the surface of cement paste to reveal the coarse aggregate, which can either be natural or manufactured. Since the surface is rough, you need to make sure it is thoroughly cleaned before applying a seal. A transparent sealant can enhance the colors of the aggregates and protect them from spalling, dusting, and stains. With its rugged appearance, little maintenance is required, other than the occasional sweeping and power washing. For quality decorative concrete installations, turn to Childers Concrete in High Point, NC. Their contractors also specialize in concrete repairs and maintenance. Get in touch with them by calling (336) 841-3111. You may also visit their website to learn more about the services they offer.